Oh, Canada . Winter has arrived with a vengeance and it's time to put all of our winter driving tips into action. 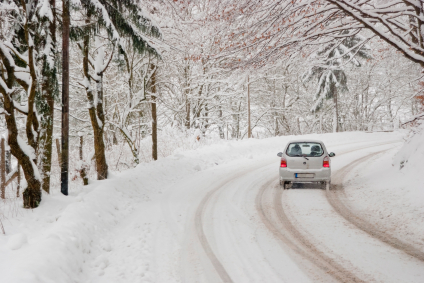 Take our winter driving quiz and find out what kind of winter driver you are! a) If you've already had summer maintenance done. b) It's never okay to skip winter maintenance. c) If the Farmer's Almanac predicts a mild winter. a) Never. I have 'all season tires'. b) About a week after it snows. c) When the temperature is consistently 7C or below. a) Stay home unless I absolutely have to go out. b) Share my planned route, destination and ETA with someone, so that if I get stranded, someone will know where to look for me. c) Fully charge my cellphone. a) Drive the speed limit. It says 100km/h and I have an ultimate driving machine, so why not? b) Drop my speed to match road conditions. c) Desperately try to keep up with people in their ultimate driving machines. a) Create traction by sprinkling the kitty litter I always carry in my car in the winter and ease myself out. b) Punch the steering wheel and have a little cry. c) Gun it, screaming "To Infinity and Beyond!" a) Indefinitely. It's a miracle it even started. b) In extreme temperatures, I'll let the car idle for a couple of minutes max. Letting my car idle for too long can actually damage the engine. c) By following this formula. Age of my car = appropriate minutes of warm-up time. 1984 Plymouth Reliant? 30 minute warm up. That's math. 7. A blanket of newly fallen snow covers your car this morning. What do you do? a) I just clean off the windshield, then drive off and let the rest of the snow fly off onto the cars behind me, the way Nature intended. b) I clean off the whole car, including the bumper and the wheel wells. Because when there's less weight on the car, it uses less fuel. Science! c) Go back to bed. 8. You've got your winter tires on. Do you really need to check the tire pressure all season too? a) I guess. I kicked the tires and hurt my foot. They seem okay to me. b) Nah. It's too cold to be outside, checking my tires. Plus, I'd have to bend over. Pass. c) Yes. Cold weather causes tires to lose pressure, leaving tires under-inflated. I check my tire pressure every month. a) Successfully unlock it, using an alcohol-based de-icer. But it's pretty rare that my locks freeze, because I keep them lubed up with a graphite-based lubricant year-round. b) Holler at my teenage daughter to bring me her industrial-strength hair dryer and an extension cord. c) Heat up my key with a lighter. 8-9 Correct - Yes! You are the Monarch of the Snow! Keep on driving safely and feel free to be smug about it. You've earned it. 5-7 Correct - Not too bad. You're no monarch of the snow, but you're at least 25th in line for the throne. You have some good solid knowledge about winter driving but could use a refresher. Start with this Winter Driving Redux post. 1-3 Correct - No. You are assigned a course of remedial reading here on PumpTalk. Check out these posts on winter driving and take the quiz again. Looking forward to my remedial reading course with Pumptalk!